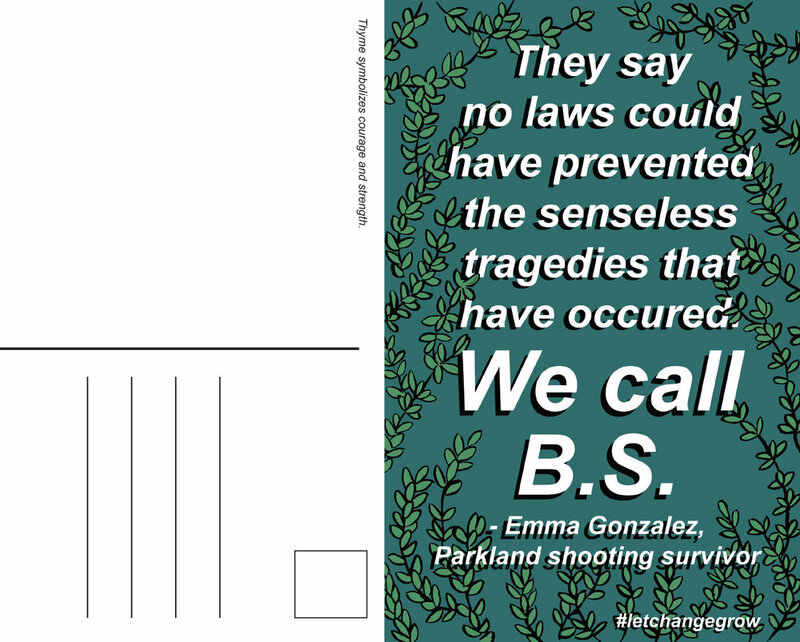 As a response to the Marjory Stoneman Douglas High School shooting I created this series of postcards featuring a quote from one of the student activists paired with a symbolic plant. Thyme symbolizes courage and strength, yellow Carnations are disappointment and rejection, and Black-eyed Susans represent justice. Designed with accessibility in mind, these postcards are available to download and print out. Each has the names and addresses of all the representatives who have accepted donations from the NRA. Users can easily find their state, print out their postcard, write a message, fold and tape the edges of the paper and send off. By doing this the user turns commemorating these student leaders into an active moment rather than a passive one.